Flesh flies (Diptera: Sarcophagidae) are commonly found in warm tropical areas, although they do occur in places not suitable for most flies. They are closely associated with humans (synanthropic) and they have been known to enter houses to colonize cadavers (Pohjoismäki 2010). Like their name entails, these flies depend on live or dead tissue to complete their life cycle (Watson and Dallwitz 2003). This family of flies is attracted to many types of dead vertebrate remains, including humans (Nishida 1984). Of the 2,000 known species in this family, 327 are in the United States. 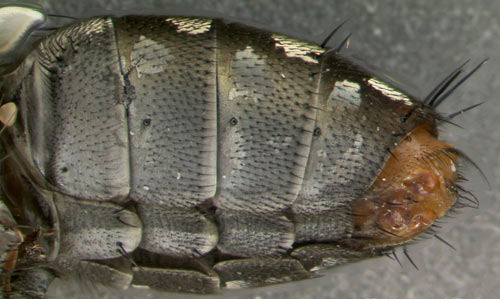 Sarcophaga crassipalpis Macquart is commonly used in laboratories to study gene expression, diapause processes, and physiological processes (Lee and Denlinger 1985). It also has a significant impact in other areas of science including parasitology and forensic entomology. Figure 1. Anterior lateral view of an Sarcophaga crassipalpis Macquart, a flesh fly. Fly is on glass, which reflects some of the legs. Photograph by Lazaro A. Diaz, University of Florida. This species was originally found in temperate climates (Chen 1990) such as the Paleartic ecozone (Iberian peninsula, Arabian peninsula, Japan) (Velasquez et al. ), but is now established in the Neartic ecozone, which includes most of North America and Greenland. Reports have also documented S. crassipalpis in the Neotropic ecozone (southern Florida, Central and South America, and the Caribbean). Due to its vast geographical distribution, this species has been described as "nearly cosmopolitan" (Cole 1969). Although the probability of laboratory lines of this species escaping and proliferating in the wild is minimal, fresh wild strains can be collected and incorporated into laboratory colonies due to its cosmopolitian distribution. 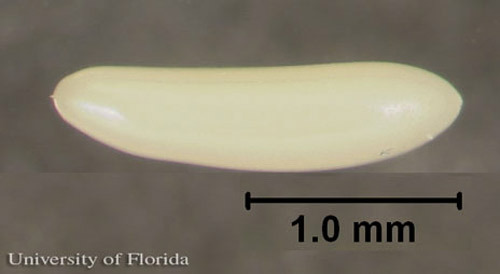 Adult: The adult ranges in size from 9 to 13 mm. 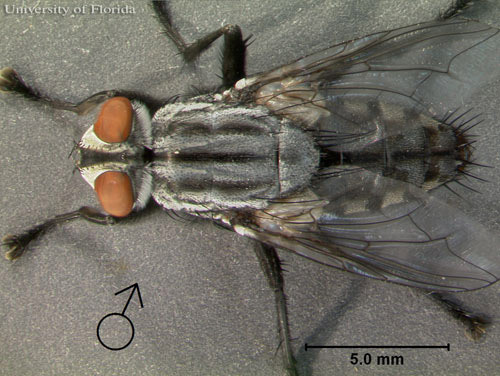 This fly is typically a light grayish color with three black stripes on the thorax (Watson and Dallwitz 2003). Unlike females, males are more hairy, with robust front legs, that assist in their attempts to copulate. 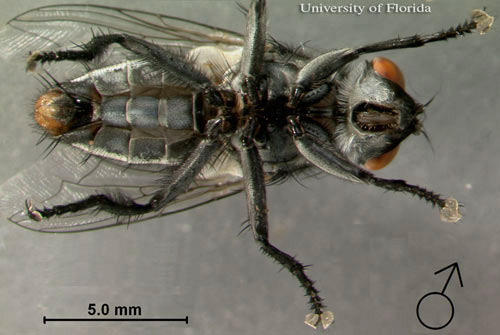 Like many flesh fly species, their "tail" or abdominal end is red for both males and females. The front femora are slightly larger than those on the remaining legs and often have a light gray coloration. Adults also have a distinctive black strip with golden or yellowish margins between their eyes. Figure 2. 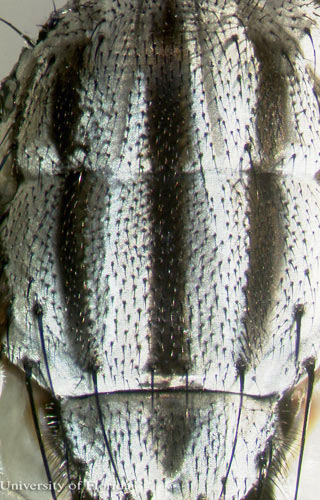 Dorsal view of the three thoracic stripes on Sarcophaga crassipalpis Macquart, a flesh fly. The head is at the top of the image. Photograph by Lazaro A. Diaz, University of Florida. Figure 3. Lateral view of the abdomen of Sarcophaga crassipalpis Macquart, a flesh fly. The head is to the left of the image. Photograph by Lazaro A. Diaz, University of Florida. Figure 4. 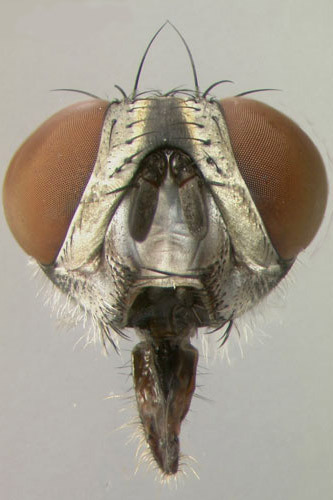 Frontal view of the head of Sarcophaga crassipalpis Macquart, a flesh fly. Photograph by Lazaro A. Diaz, University of Florida. Figure 5. Dorsal view of adult female Sarcophaga crassipalpis Macquart, a flesh fly. Photograph by Lazaro A. Diaz, University of Florida. Figure 6. Dorsal view of adult male Sarcophaga crassipalpis Macquart, a flesh fly. Photograph by Lazaro A. Diaz, University of Florida. Figure 7. Ventral view of adult female Sarcophaga crassipalpis Macquart, a flesh fly. Photograph by Lazaro A. Diaz, University of Florida. Figure 8. Ventral view of adult male Sarcophaga crassipalpis Macquart, a flesh fly. Photograph by Lazaro A. Diaz, University of Florida. 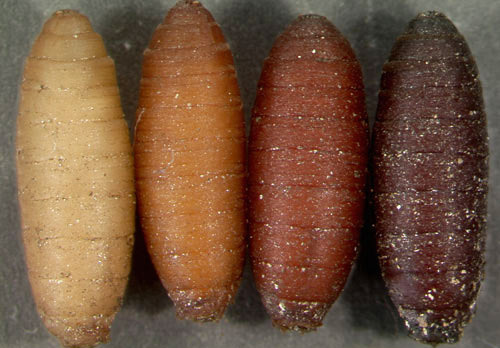 Pupa: The pupa ranges in size from 5 to 10 mm, and color tends to be relative to the age of the pupa. In general the darker the color the more advanced the fly is in pupal development. Figure 9. 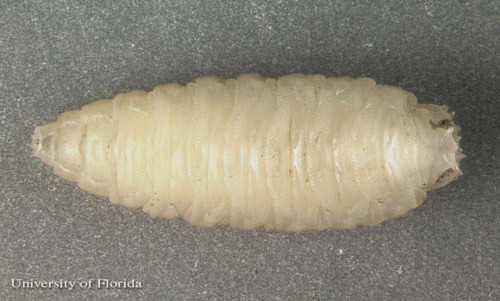 Dorsal view of a pupa of Sarcophaga crassipalpis Macquart, a flesh fly, with scale size. The head is to the right. Photograph by Lazaro A. Diaz, University of Florida. Figure 10. 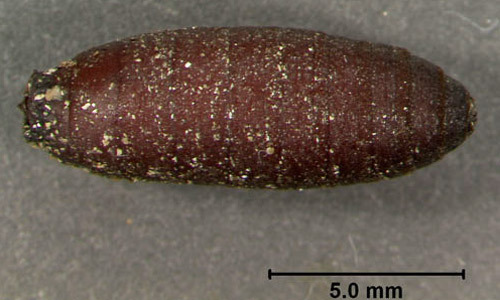 Darkening pupa coloration in Sarcophaga crassipalpis Macquart, a flesh fly, indicates advancing development within that stage of the life cycle. Photograph by Lazaro A. Diaz, University of Florida. 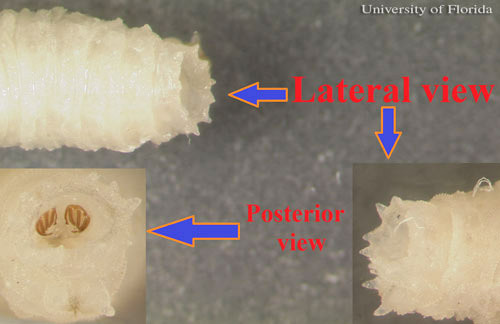 Larva: In the final instar, the larval body ranges from 9 to 13 mm in length. Spiracles are located on plates set inside a cavity or pit on the posterior end. Figure 11. 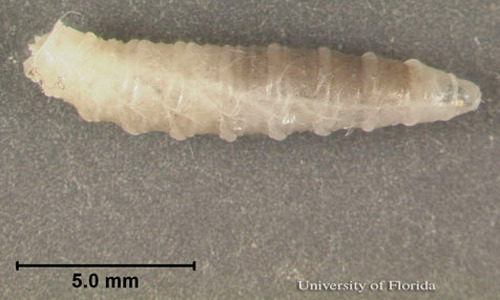 Lateral view of a larva of Sarcophaga crassipalpis Macquart, a flesh fly, with scale size. The head is to the left. Photograph by Lazaro A. Diaz, University of Florida. Figure 12. Multiple views of posterior end and spiracles of larvae of Sarcophaga crassipalpis Macquart, a flesh fly. Photograph by Lazaro A. Diaz, University of Florida. Figure 13. Lateral view of adult Sarcophaga crassipalpis Macquart, a flesh fly. Photograph by Lazaro A. Diaz, University of Florida. Eggs: The eggs undergo full development and hatch within the female. The images below are of eggs dissected from females prior to hatching. Figure 14. 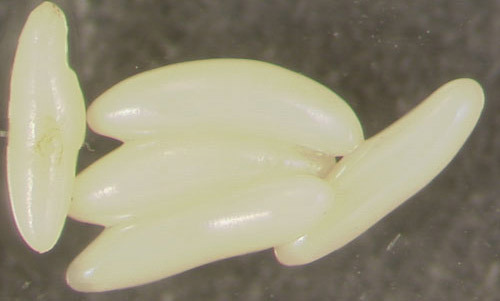 Lateral view of an egg of Sarcophaga crassipalpis Macquart, a flesh fly, with scale size. Photograph by Lazaro A. Diaz, University of Florida. Larvae: Female flesh flies deposit their 1st instar larvae directly on the host and the larvae commence feeding immediately. These larvae eat and develop rapidly. Approximately five days after larviposition, the larvae are already in their 3rd instar and are almost ready to pupate. When the larvae are ready to pupate, they leave the host and wander until they find a suitable location. Figure 15. Lateral view of an egg cluster of Sarcophaga crassipalpis Macquart, a flesh fly. Photograph by Lazaro A. Diaz, University of Florida. Figure 16. 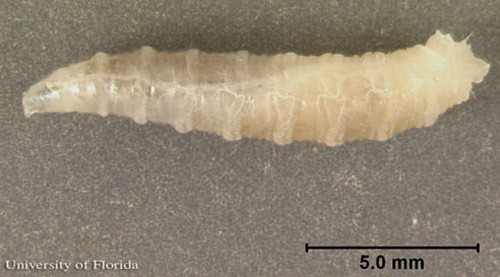 Lateral view of 3rd instar larva of Sarcophaga crassipalpis Macquart, a flesh fly, with scale size. The head is to the right. Photograph by Lazaro A. Diaz, University of Florida. Pupae: Pupation starts approximately one week after larviposition at 25°C. Adult flies will emerge about 10 days after pupation has occurred. Sarcophaga crassipalpis have facultative diapause; meaning that they are able to enter, if necessary, a "hibernation"-like state where metabolic processes are reduced almost to a complete stop until appropriate environmental conditions return (Henrich and Denlinger 1982). In S. crassipalpis, diapause occurs during the pupal stage. Diapause can be pre-determined by environmental cues such as change in temperature, humidity, and/or light availability experienced by the mother prior to larviposition. The larva's environmental perception after larviposition also can induce diapause. Figure 17. Dorsal view of the pre-pupa larval stage of Sarcophaga crassipalpis Macquart, a flesh fly. The head is to the left. Photograph by Lazaro A. Diaz, University of Florida. The diversity of hosts used by sarcophagids is almost as great as the number of species within the family. 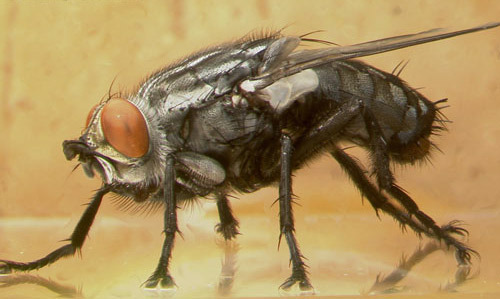 Some flesh fly species are parasitoids, attacking and developing within other arthropods (Coppel 1959), while most have been found on varying types of carrion: pig carcasses, human cadavers, and/or wildlife (Goff 1991). Although S. crassipalpis is known as a carrion-inhabiting species, they have been reported to cause myiasis in humans (Morris 1987). Myiasis is a parasitic condition in which the maggots infest a living host, in this case a human being, and feed on the living or dead tissue present. Flesh flies commonly colonize human remains early in the decay process (Nishida 1984). Although they are not the predominant type of fly found in situations of forensic importance, they can be valuable evidence when present (Nishida 1984, Goff 1991). Sarcophagids are a very useful tool for the forensic entomologist, like many other insects, they can be used to estimate the time of colonization which can be used to infer a minimum postmortem interval (m-PMI) (Nishida 1984, Oliveira-Costa and Mello-Patiu 2004). Weather conditions and geographic location are key factors to consider when using insect evidence to estimate the m-PMI of a corpse as the variation associated with time of colonization after death is not completely understood at this time (Catts 1992). 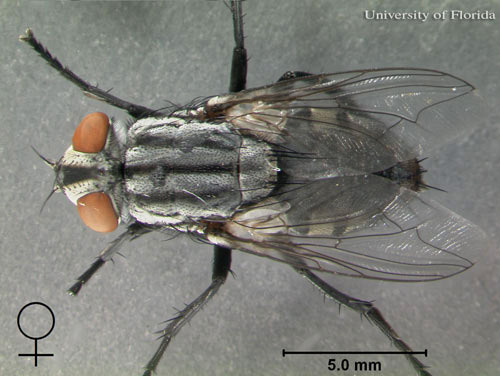 This particular species of flesh fly is commonly thought of as the "lab rat," and therefore it is usually overlooked when dealing with issues of forensic entomology. Over the years scientists have conducted and documented countless experiments on S. crassipalpis. Most of these experiments were studies regarding diapause and physiological responses to environmental changes (temperature, light, and humidity changes) (Nishida 1984, Velasquez et al. 2010). The data accumulated regarding sarcophagid development under different environmental conditions are vast (Grassberger 2002) making flesh flies an effective tool to accurately calculate a postmortem interval range (Nishida, 1984, Goff 1991). Florida Insect Management Guide for filth-breeding flies. Catts EP. 1992. Problems in estimating the postmortem interval in death investigations. Journal of Agricultural Entomology 9: 245-255. Chen CP, Lee Jr RE, Denlinger DL. 1990. A comparison of the responses of tropical and temperate flies (Diptera: Sarcophagidae) to cold and heat stress. Journual of Comparative Physiology B 160: 543-547. Cole FR. 1969. The Flies of Western North America. University of California Press Berkeley and Los Angeles. 693 pp. Coppel HC. 1959. Studies on dipterous parasites of the spruce budworm, Choristoneura fumiferana (Clem.) (Lepidoptera: Tortrigidae) VII. Agria affinis (Fall). (Diptera: Sarcophagidae). Canadian Journal of Zoology 37: 609-815. Goff ML. 1991. Comparison of insect species associated with decomposing remains recovered inside dwellings and outdoors on the Island of Oahu, Hawaii. Journal of Forensic Sciences 36: 748-753. Grassberger M, Reiter C. 2002. 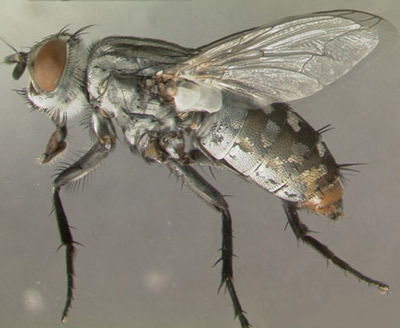 Effect of temperature on development of the forensically important holarctic blow fly Protophormia terraenovae (Robineau-Desvoidy) (Diptera: Calliphoridae). Forensic Science International 128: 177-182. Henrich VA, Denlinger DL. 1982. A maternal effect that eliminates pupal diapause in progeny of the flesh fly, Sarcophaga bullata. Journal of Insect Physiology 10: 881-884. ITIS. (2011). Sarcophaga crassipalpis Macquart, 1839. Integrated Taxonomic Information System. http://www.itis.gov/ (9 September 2011). Koehler PG, Oi FM. (March 2003). Filth-breeding flies. EDIS. http://edis.ifas.ufl.edu/ig091 (9 September 2011). Lee, Jr RE, Denlinger DL. 1985. Cold tolerance in diapausing and non-diapausing stages of the flesh fly, Sarcophaga crassipalpis. Physiological Entomology 10: 309-315. Morris B. 1987. 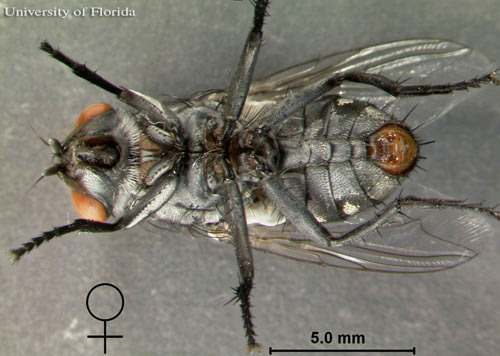 First reported case of human aural myiasis caused by the flesh fly Parasarcophaga crassipalpis (Diptera: Sarcophagidae). The Journal of Parasitology 73: 1068-1069. Nishida K. 1984. Experimental studies on the estimation of postmortem intervals by means of fly larvae infesting human cadavers. Japanese Journal of Legal Medicine 38: 24-41. Oliveira-Costa J, Mello-Patiu CA. 2004. Application of forensic entomology to estimate of the postmortem interval (PMI) in homicide investigations by the Rio de Janeiro Police Department in Brazil. Anil Aggrawal's Internet Journal of Forensic Medicine and Toxicology 5: 40-44. Pohjoismäki JLO, Karhunen PJ, Goebeler S, Saukko P, Sääksjärvi IE. 2010. Indoors forensic entomology: Colonization of human remains in closed environments by specific species of sarcosaprophagous flies. Forensic Science International 199: 38-42. Uni S, Shinonaga S, Nishio Y, Fukunaga A, Iseki M, Okamoto T, Ueda N, Miki T. 1999. Ophthalmomyiasis caused by Sarcophaga crassipalpis (Diptera: Sarcophagidae) in a hospital patient. Journal of Medical Entomology 36: 906-908. Velasquez Y, Magaña C, Martinez-Sanchez A, Rojo S. 2010. Diptera of forensic importance in the Iberian Peninsula: Larval identification key. Medical and Veterinary Entomology 24: 293-308. Watson L, Dallwitz MJ. (July 2011). British insects: the families of Diptera. http://delta-intkey.com/britin/dip/index.htm (09 September 2011). Publication Date: September 2011. Last revision: January 2013.